Studies and research has proven that munching on high quality chocolate can improve health and wellbeing in a number of positive ways. Yay! Provided that you’re not regularly bingeing on the stuff, eating a little bit of chocolate every day is good for you. In fact, it’s possibly the cure for a multitude of things. For many people chocolate is the ultimate comfort food. This creamy, melt in the mouth treat is there for you in times of stress or emotional let down. When you’re feeling out of sorts, chocolate lifts your mood. If you’re loved up, chocolate induces feelings of romance. The versatile delectable treat really is almost too good to eat. Dark chocolate has been found to help restore flexibility to arteries, and also to prevent white blood cells from sticking to the walls of blood vessels. This means that arteries don’t clog up, and therefore blood circulation is improved. Other health benefits of eating high quality dark chocolate include a delay in, or the prevention of, the onset of diabetes. Studies also show that the consumption of cocoa can reduce levels of ‘bad’ cholesterol, whilst raising ‘good’ cholesterol levels. Chocolate that boasts a high percentage of dark cocoa is high in antioxidant properties. This means that the risk of stroke, heart attacks and cardiovascular disease is reduced. Chocolate is also good for the brain, and can help boost concentration. Research shows that eating chocolate increases mental functions so that you are able to perform well on tests. 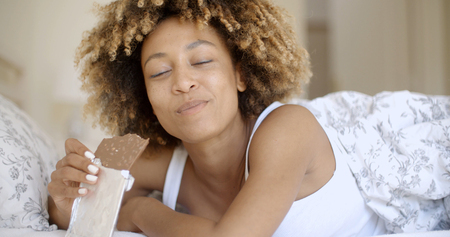 If you love chocolate you already probably know how good it is at minimising your stress. Mineral rich chocolate contains phenylethylamine (PEA), which is the chemical that your brain creates when you’re falling in love. The happy feeling is triggered by the release of feel-good endorphins. Chocolate is a love drug that enhances your mood. It is also the edible treat that is most often shared by lovers. When you eat your favourite sweet treat, everything is alright with the world. Eating chocolate can help you lose weight. Nibbling on a few squares of fibre rich bittersweet dark chocolate can make you feel satisfied and full, so that you actually eat less at mealtimes. Your usual snack cravings for sweet, salty and fatty foods will also be reduced. The flavonols in dark chocolate can help to protect your skin against UV sun damage. Flavonols are antioxidants that protect the skin against free radical damage so that it remains soft and supple for longer. Many complementary beauty and massage treatments use cocoa as a key ingredient. When combined with caffeine, cocoa makes a great skin detoxifying treatment that exfoliates and removes dead skin cells, allowing fresh skin to be revealed. If you still need convincing that chocolate is good for the heart, mind, body and soul, choose fairtrade chocolate that is made from cocoa beans that are grown and harvested by farmers who are fairly paid for their work. Women make up 25% of all fairtrade cocoa growers. There are around 1,460 fairtrade chocolate products to choose from in the UK alone. Choose from premium, organic, gluten free and vegan chocolate and enjoy your naughty, but good for you, treat.